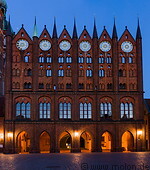 The Alter Markt is a 60m by 80mm square in the north of the historic core of Stralsund. It dates back to the 13th century, when it started being used as a place where to assemble and sell products. The Alter Markt is surrounded by a number of historic buildings, for instance the town hall with its red brick facade with seven copper turrets and six triangular gables and the St Nicholas church (Nikolaikirche) built in Gothic style in 1270. The Wulflamhaus was set up in 1358 in late Gothic style by the homonymous Wulflam family.